Artist Ellie Harrison (self-)critically responds to the Biennale experience and the PRESS ROOM project. Ellie Harrison, “Venice Biennale: Think Local, Act Global!” Photographed with Alberta Whittle & Farieda Nazier performing “A Journey of Aspiration” for The Johannesburg Pavilion at La Biennale di Venezia on 7 May 2015. 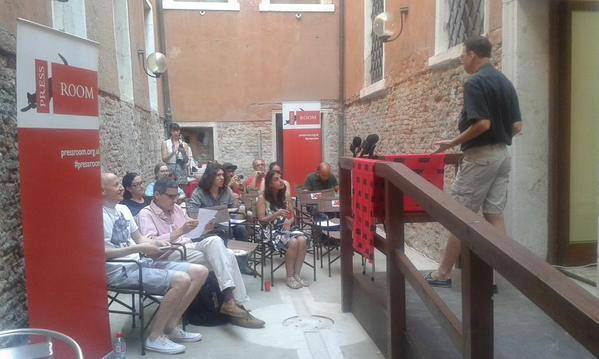 I felt a little guilty about my trip to Venice as part of the EM15 project Doug Fishbone’s Leisure Land Golf. Competing in the art world’s original Olympics (albeit on behalf of the underdogs: team East Midlands), made me feel as though I was compromising my values somewhat. Over the past decade (since my last trip to Venice as a naïve and enthusiastic art-tourist in 2005), I’ve been attempting to live my values and actively address my concerns about climate change by “thinking globally and acting locally” as the old saying goes. Trying to cut my carbon footprint (and increase my sense of belonging) by observing the Biennale phenomenon from a critical distance and, instead, taking pride in being a ‘national artist’ (better still a ‘regional artist’). This means less about representing my region on a ‘world stage’ and more about building meaningful relationships with arts organisations, supportive curators and communities to create and present socially relevant work close to where we all live. But in 2015 my ego got the better of me, when I gladly accepted the invitation to be part of Doug Fishbone’s quirky project. As my fellow EM15 artist Yara El-Sherbini and I acknowledged on arrival at our beautiful apartment in the fairytale city to find our artworks already fabricated and installed on our behalf: it’s clear the more “successful” you become as an artist, the less work you have to do for greater reward. This was the best paid gig I’d ever been offered: £2,000 fee, £3,000 production, travel and accommodation plus a daily stipend (part of what made it so irresistible). But it got me thinking about the total amount of money being spent – not just on the EM15 pavilion, but in the Biennale as a whole. Was this really the best way of investing regional / national arts budgets? Sucking money away from local communities by shipping slick artworks (and high profile artists) to another, fairly inaccessible part of the world. How much carbon was this exercise in ‘soft power’ producing? Hmmm… how could I address these issues? Kinda tricky through the medium of a crazy golf hole! Instead I reverted to the perennial artist-activist tactics of attempting to ‘practice what I preach’ and then ‘biting the hand that feeds me’. I first tried to minimise the impact of my own participation by taking the 23 hour trip from Glasgow to Venice via train. But realising this to be a relatively tokenistic gesture in the grand scheme of things, I then chose to acknowledge my own stupidity by designing a t-shirt emblazoned with my new slogan for the artworld: Think Local, Act Global! – i.e. the absolute opposite of what we need to be doing to address climate change. My obnoxious Biennale character (always clad in shades, quaffing a Prosecco with a gorgeous gal on each arm) began as a critique, but after four days of absorbing the decadence – being plied with free alcohol and food – I realised how quickly I could turn to the dark side, (get fat and sick), and lose sight of my values in the process. Venice is not the place for real ‘political art’. This is something Doug and I discussed over dinner on our final night: nearly all gestures become impotent in those very particular surroundings, far removed from the reality of most people’s everyday lives. The Guardian headline “Marx for the Millionaires” beautifully captures the contradictions inherent in Okwui Enwezor’s sincere centrepiece show. (From what I got to see, only Christoph Büchel’s intervention successfully addresses the context of the ‘historic city’ in a meaningful and provocative way). Where Doug Fishbone’s Leisure Land Golf succeeds however, is in its knowing decision to give the Venice audience exactly what it seeks / deserves: unashamed entertainment. The joke is on them, ultimately, for taking part (see Tim Marlow taking a shot here). 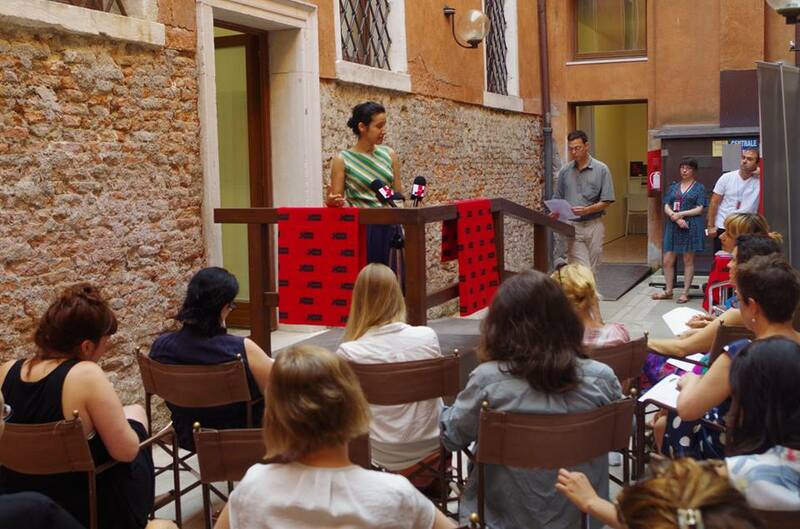 And so PRESS ROOM’s valiant attempt to inject some criticality into the coverage of the Biennale – to mobilise artists at Venice for some greater political cause (see Gaynor Flynn’s Artists For Nepal) – also seemed futile. What became painfully clear when discussing these issues with a group of UK artists at their ‘press briefing’ on Thursday 7 May – sitting eating croissants in a charming café in San Marco on the day of our General Election – was that the real ‘political artists’ had stayed at home. Categories: Briefings, Responses | Permalink. Breakfast press briefings on the second morning of PRESS ROOM ranged from the UK General Election, questions on ‘the zeitgeist’ and originality and a shared concern to respond to the crisis in Nepal. Who funds the Venice Biennale? Break down (or estimate) the make-up of private vs public funding of the Biennalel. What is the budget of the Venice Biennale organisation itself for this year’s biennial as a proportion of the total costs of putting on the Biennale (which would include, for example, the costs borne by national pavilions through public funding as well as by commercial galleries and patrons specific to each presentation). How does the inclusion of national pavilions over time relate to global balances of political power? VB: vanity blossoms. Arty partays portray the indulgences of Those that Chose, How to Please, What Sells, and Vapid Betokenisms. In 2005 a controversial plan to replace the Bexhill-On-Sea crazy golf course with a Boutique Hotel led to me prudently installing my own crazy golf course into the adjacent, just refurbished, listed, modernist De La Warr Pavilion, thereby preserving the town’s cultural heritage. Here is a video and a review of the installation. At the 2015 Venice Biennale artist Doug Fishbone is installing a crazy golf course. All reportage will be used to help contextualise my forthcoming commission – to install a Crazy Golf course in Rafael Vinoly’s landmark Firstsite building in Colchester (the town’s crazy golf course has just been demolished) which opens in June. The 2013 Venice Biennale had the Wunderkammer as its curatorial focus. Massimiliano Gionithe’s Encyclopedic Palace. This year the 56th year of the Bienale, Okwui Enwezor has created a show entitled All the Worlds Futures, a title that to me conjures a post-war ethos and the spirit of the United Nations. 1930s as is evidenced by the majority of Fascist chic pavilions. In 1974 the biennale was dedicated to Chile as a political statement to Pinochet and in 2013 Udo Kittelman the director of the Nationalgalerie, State Museums of Berlin included the Chinese artist Ai Weiwei in the German pavilion. For me the biennale will always be a Wunderkammer; an (often male) curator’s vision of a perfect world in miniature. Sometimes the Wunderkammer of the 1600s were completely invented in the mind and didn’t exist in reality at all. Often like Sloane’s they held a herbarium. Venice itself has the atmosphere of an overwhelming and supernatural island that deserves its own collection of curiosities. Your brief for Venice is to visit, read or collect as many of these as you can and create your own biennale Wunderkammer. Prostitute spotting on the way in.